Simply bring down your items to our convenient location, and we will appraise then and advise you the best way to sell them. We store all items in-house so we can take it off your hands. but we will be the judge. We can sell just about anything! In today's day in age the internet has connected buyers and sellers all over the world. QuikDrop advertises your item on eBay for you world-wide. With our selling techniques QuikDrop is sure to get you top dollar for your items. 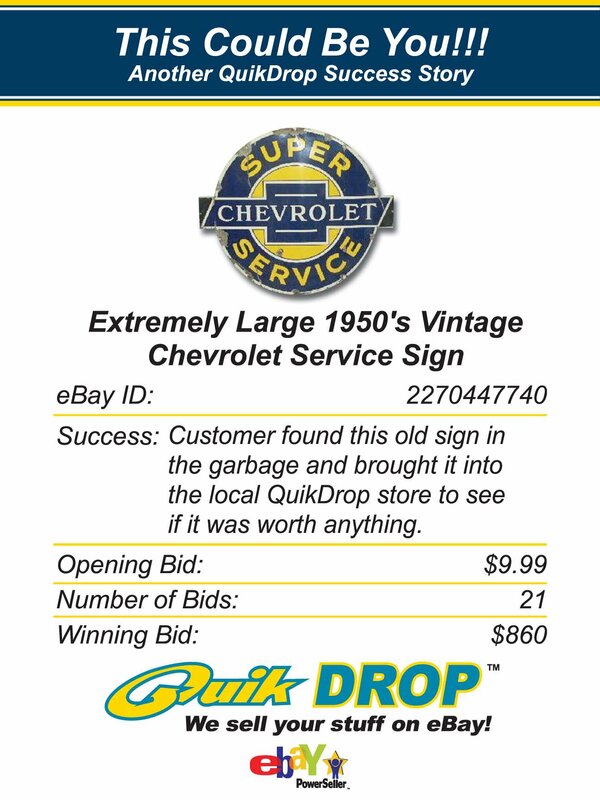 QuikDrop is your local eBay store dedicated to providing a simple, fast and convenient way to sell items and vehicles on eBay. We provide our service FREE of charge until your item sells! Customers bring in items or vehicles that they would like to sell worth at least $50.00 or more. Digital photographs are taken, then edited. Text is written and an attractive, detailed listing is placed on eBay. QuikDrop tracks the listing, answers questions from prospective buyers, processes payment, packages the item, and ships it to the buyer. You then get a check! QuikDrop can assist you in selling your items on eBay. We specialize business & estate liquidation services! Simply bring down your items to our convenient location, and we will appraise then and advise you the best way to sell them. We store all items in-house so we can take it off your hands. We have a $50 minimum per item, but we will be the judge. Once we receipt you, we begin to research your item. Our graphic artists photograph and edit your item making it look the best it can. We give your item a detailed and a jaw dropping publication on eBay. Your item runs for 7 or 10 days on eBay! Once your item is posted, we email you a copy of the listing to watch from start to finish. You can see your items full activity! During this time we answer any inquiries on your item from prospective buyers, and quote shipping around the world. When your item sells on eBay we move quickly to collect payment. Once payment clears, our shipping department safely and promptly packages and ships the item to the buyer. After satisfaction from the buyer, a check is printed and mailed directly to your home or business!